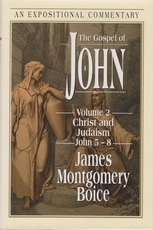 An Expositional Commentary "Each volume in the five-volume series comprises a major section of the Gospel..The second, 'Christ and Judaism,' deals with the hostility toward Jesus that began to arise among the religious leaders after he came into this world . . . James Montgomery Boice not only explains the meaning of the text verse by verse and section by section, he relates the text's concerns to the world in which we live, the life of the church, and the realities of the Christian life."